FRANC VILA unveiled a new timepiece featuring 5 minutes repetition complication and built to provide a clear sonority thanks to the use of Lightnium combined with titanium. 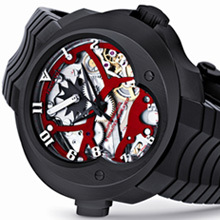 The new watch, named FVa35 SuperSonico 5 Minutes Repeater, is included in the brand’s SuperLigero Concept collection. With the introduction in 2008 of the FVa Nº 6, a skeleton tourbillon with 5 days of power reserve, Franc Vila inaugurated his well known and successful collection named SuperLigero Concept. The concept consists in the development of different masterpieces with the characteristic of being very light while extremely robust in order to provide to the Haute Horlogerie lovers a collection of contemporary and complicated watches able to withstand exigent sport activities. The common element in all the timepieces introduced under the SuperLigero concept is the use of Lightnium, an aluminium-lithium based alloy used in state of the art aeronautical engineering. It’s main characteristics are lightness combined with high-tensile strength, allowing structural weight reduction and an increase in the elastic modulus performance. These characteristics allow for the development of very robust movements like the FV Nº 6 skeleton tourbillon or the FV Nº Cuatro SuperLigero chronograph tourbillon. In new FVa35 SuperSonico 5 Minutes Repeater SuperLigero Concept this advanced material brings furthermore a very important virtue regarding the sonority of the minute repetition. The FVa35 is a very sporty repeater in which the use of Lightnium enhance its sound performance. The rigidity of Lightnium, its low density and elastic modulus are optimal to ensure the best possible sonority. The density parameter is one of the most important for the transmission of the sound through the materials and it is considered a good value when it is lower than 5 g/cm3. For this reason titanium is a good material for the construction of the watchcases for repeaters, with 4.2 g/cm3. The alloy used in Lightnium provides a density of just 2.4 g/cm3, making it perfect for the transmission of sound. Also, the elastic modulus of this material is 79 GPa, far away of the 100 GPa maximum limit considered to be optimal for the transmission of sound. Due to these superb attributes of Lightnium, in the FVa35 the inner part of the watchcase is made in this material, which is in charge of transmitting the sound with the lowest possible loss of energy to the outer part of the watchcase, made in high-grade titanium. This combination of titanium and Lightnium ensures optimal sound qualities for the repetition complication. The movement has been designed to exhibit a complete view of the sonnerie movement with a skeleton like approach which shows all the movement, with its gongs and hammers, in an impressive three-dimensional deep sight. In order to provide the best view of the mechanism, Franc Vila chose to avoid the use of dial with the intention to show the naked beauty of the movement when the minute repetition is activated on demand with the pusher. In words of Mr. Franc Vila, the repeater is one of his favorite complications, due to the high complicated mechanism needed to convert time to music. “For this reason I think it is the most poetic complication. In fact, the first FRANC VILA watch, which I made just to satisfy my quest of the perfect watch for me, was a perpetual calendar with minute repeater. I’ve been working since long time in order to create a collection of repeaters, and the FVa35 SuperSonico is the first timepiece in this collection. The introduction of the FVa35 SuperSonico 5 Minutes Repeater consolidates the SuperLigero Concept collection and proves the skills of Franc Vila when it comes to the use of new materials, thanks to his multi-discipline background. Once again, FRANC VILA achieves the aim of bringing to the high-end watchmaking a classic complication in a contemporary and sporty timepiece. sided antiglare treatment. Repeater pusher at 8\\\\\\\'. Water resistant to 100 meters. - High Grade Mechanical Self-Winding hand finished complicated movement Caliber FV35. FRANC VILA Exclusive “Gold Concept Rotor”. Power reserve of 42 hours. - Hours, minutes and seconds. 5-minutes repeater. crocodile leather strap with red stitching also included.